The Sports Turf Management Assn. (STMA) recently gave Echo Robotics its “Innovative Award” for the Echo Autonomous Mower TM-2000. STMA’s Innovative Award Program recognizes STMA commercial company members who’ve developed a product, service, equipment or technology that substantially enhances the efficiency and effectiveness of the sports turf manager and/or makes the playing surfaces safer and/or more playable for athletes. Chosen by STMA’s Innovative Awards Task Group, entries are evaluated on a wide range of qualities including whether or not they fill a need; are creative; save time and resources; are cutting-edge; make a task easier or more productive; improve quality; protect the environment and improve efficiency. 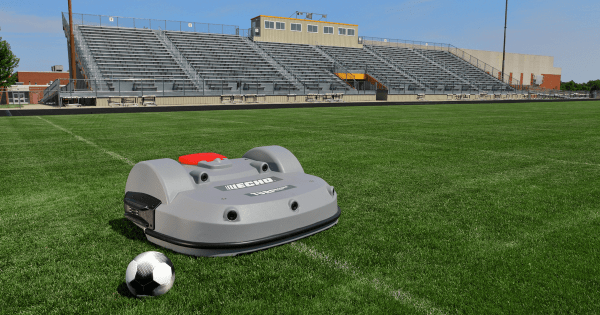 The self-driving, self-charging, self-sufficient Echo Autonomous Mower TM-2000 unit mows up to five acres of turf efficiently while finely mulching clippings to promote turf health. Eight times more efficient than traditional units, this mower saves time and labor for facility managers, and can be remotely commanded via web platform or mobile app.